I have lots of pumpkins rattling around the house from Halloween decorating and wanted to repurpose one for the Thanksgiving table. Check out my post on Pumpkin Eye Candy to see how many amazing pumpkin heirlooms there are available in the local markets. 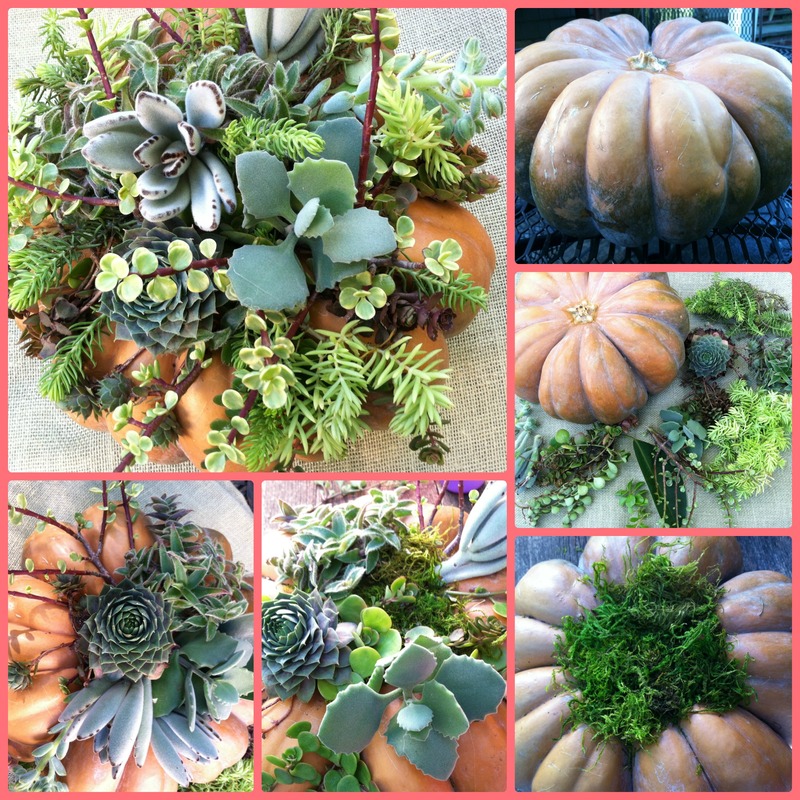 I love the grey green color of the heirloom pumpkin Jarrahdale, but didn’t want to cut into it, so I built the flower arrangement on top. 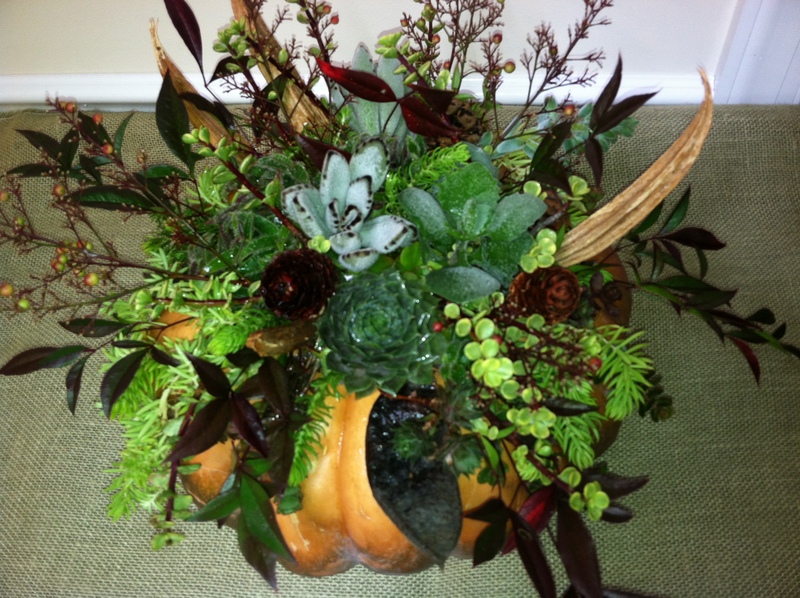 Jarrahdale is also a wide low pumpkin that is a great centerpiece height. Jarrahdale pumpkins have a nice concave top and it was easy to cut my wet oasis, cover it with chicken wire, and nestle it into the top of the pumpkin. The chicken wire keeps the oasis from breaking up from too many large stems being inserted. Stick a few picks into the oasis pinning it to the pumpkin so the oasis doesn’t slide around. Start greening your oasis with short stems of foliage of eucalyptus. Here I used seeded eucalyptus and add some color with yellow pom poms. I picked these up at a local florist. 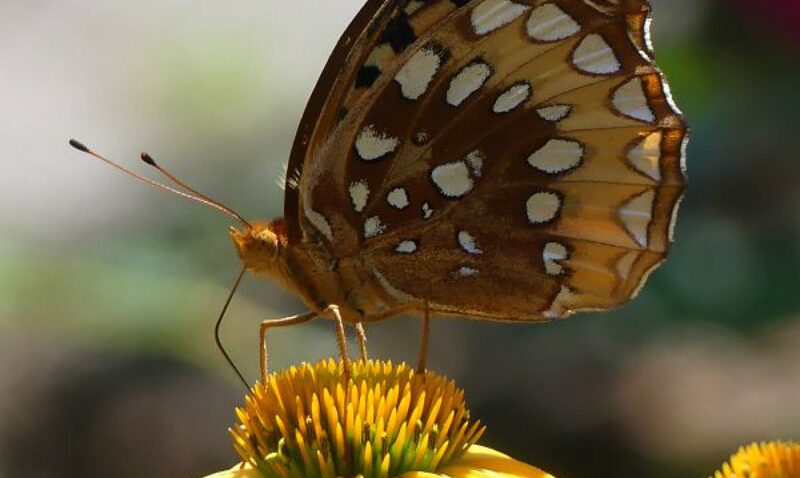 But you could use cut greens from your yard and berries from the fields to cut your costs. 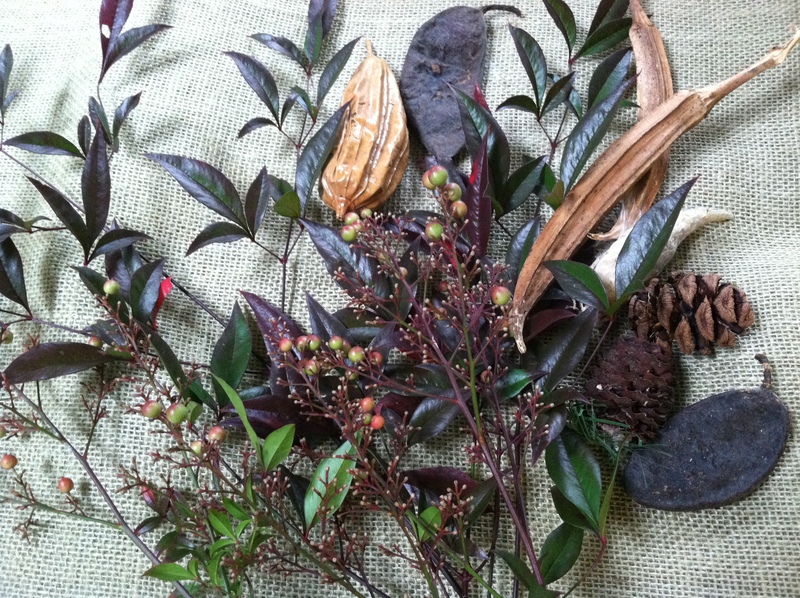 Continue adding the yellow pom poms, hypericum berries or any other red berry, blackberry lily seed heads, and Eucalyptus pods. 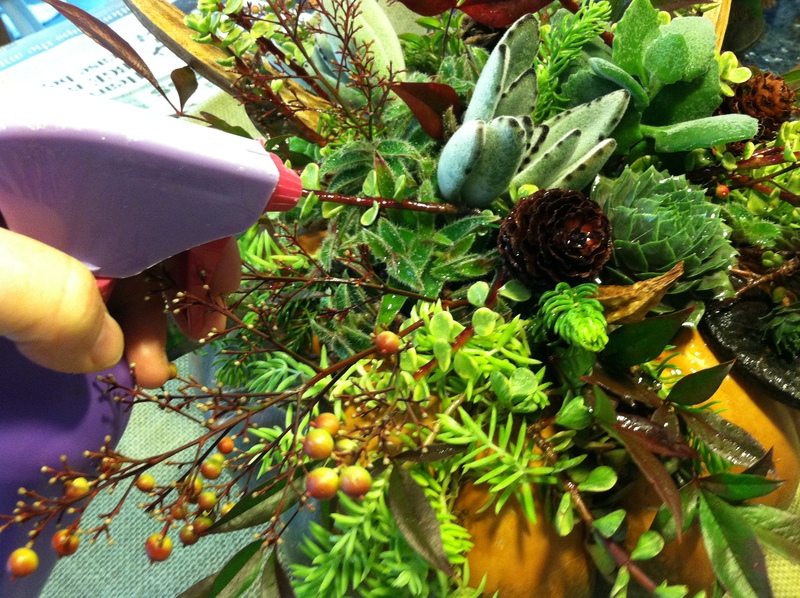 Top off with your larger flowers- the green spider mums, and spritz the botanicals to fully hydrate everything so it keeps until Thanksgiving. 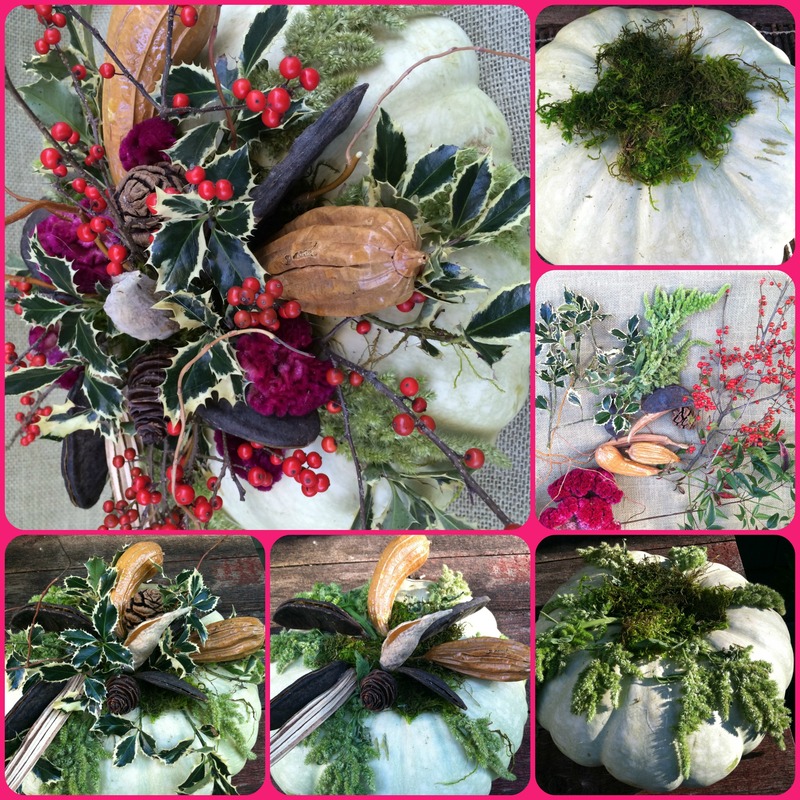 Keep the pumpkin in a cool dark place until ready to use and Give Thanks!! 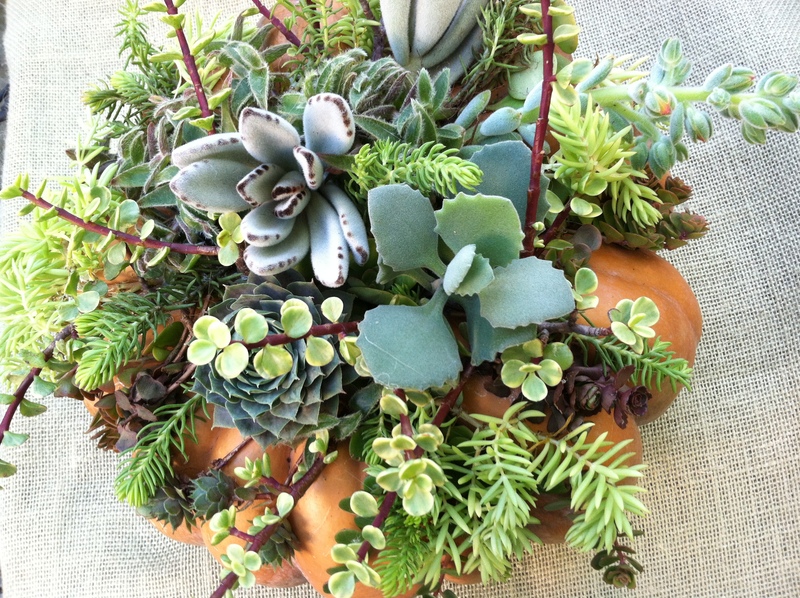 For decorating pumpkins with succulents, go to Pumpkin Treats-Decorating with Succulents. 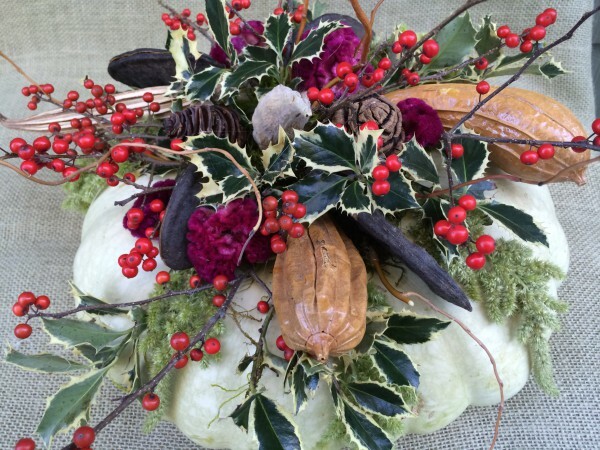 For a Christmas pumpkin, go to Decorated Pumpkins with Berries, Pods, and Drieds.